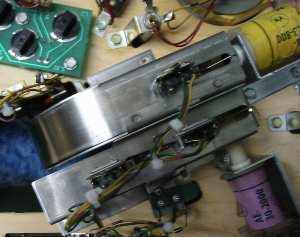 Flippers.be - Restoring, shopping and cleaning a pinball machine - part 4. Now you have access to everything on the playfield and assemble parts again it's easy to make small adjustments. You should have noted which switches were bad or didn't always register. Also adjust pop bumper and slingshot switches so they're (very) sensitive. Test and repair everything else which you noted as having difficulties. Here is described in detail what 'adjusting switches' means and how you should do it. Work in reverse order of how you disassembled everything. Put all the cleaned parts back onto the playfield. Take care how you assemble things. And take a good look at all parts, as well under as above the playfield. Remember with a shop-job we are also trying to prevent future problems, so correct anything that may cause a problem later. Especially underneath the playfield you have to take a good look at the wiring while you're assembling parts back on the playfield. Check there is nowhere a wire stuck, pinched or loose. Test every light bulb before you put it back. Some people just use new light bulbs everywhere. If you do, then at least try to test the lightbulbs for an hour, as there may always be bad ones which burn very fast. Make sure you put good (new) light bulbs in hard to reach spots, i.e. underneath ramps or in covered pop bumpers. Most other light bulbs on a pinball game are easy to reach from underneath the playfield. I don't replace every bulb. I only throw away broken bulbs and these which have a burnt/silver top, because they draw more current and generate more heat. I do run my used bulbs for a few hours in my tumbler. The base is then clean and makes good contact again, and if they've survived the vibration of the tumbler (almost all do) then they will survive being in a pinball machine too. Some people replace all #44 type light bulb with the #47 type. This type draws less current, as it uses only 0.15 amps compared to the 0.25 amps of the #44 type. They produce less heat, but also less light. Personally I only install #47 light bulbs inside pop bumpers (as they're enclosed and the heat cannot escape the plastic) or when they're very close to plastics. Sometimes on old types of games (first generation electronic games) I will install more #47 light bulbs. On more recent games it is in my opinion not necessary in my opinion to replace every light bulb with the #47 version. The game will not look as bright. On recent pinball games they tried to cut costs as much as possible, so most already have dark playfields, with only bulbs where it's absolutely necessary, so you want every GI bulb to be as bright as possible. The main reason on to replace light bulbs on a recent games is that the GI connectors usually burn because they can't handle the load. But once these connectors are replaced with new ones, these are good again for many years. Especially in home-use a pinball machine will not be on all day long, so a new GI connector will (almost ?) never burn..
WPC games also have adjustments to set a power saver that will dim the lights after a few minutes of idle time. So make sure you set this adjustment to the minimum time and minimum level (A.1 - GI Power Saver Time and GI Power Saver Level). On older games not only the connectors but also other components like bridge rectifiers, transformer and even wires are older and more stressed. Putting #47 lamps can make a difference there in the long run. But here it will also depend on the situation and use your common sense. If you'll leave the game on for many hours every day, then it can be useful. But if you only turn it on every few days to play a few games, it will probably not make much difference. If you've replaced burnt connectors and let #44 bulbs in, don't think that after a few months your new connectors will have burnt already. What some people do is only remove a few bulbs behind the backglass. On most games that's more than enough lit, and the removed bulbs will also decrease the load a bit on the electric components. More important, there will be less heat that can damage the backglass. And this solution was free, no need to invest in special bulbs. So just use your common sense and see how much money you want to spend. If you want to buy all new #47 light bulbs, fine for me. If you don't, then only replace them where it matters (like under popbumpers and close to other plastic parts) or i.e. leave out some bulbs from clearly lit parts if you want to do something. It just depends if you leave on your game on for many hours, so things can run hot or not. Install colored bulbs, extra light bulbs or leds. Some parts of the playfield may be too dark. It's possible to install extra light bulbs or leds (preferred because they draw less current) and hook them up to the existing light bulbs. But you have to know what you're doing, as most strings of bulbs may already be on their maximum load. 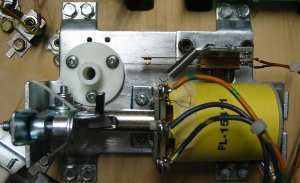 Adding light bulbs to a string may cause fuses to blow or the connectors/pins to burn. To prevent this you should install #47 bulbs instead of #44 bulbs. An easy modification is to install colored light bulbs instead of the regular white ones. On some games they make the game look a lot better. But this is all a matter of taste. Now the playfield is open and all light bulbs are accessible, it's the time to experiment.. Here is an example of the difference colored light bulbs can make. Clean or replace (drop) target decals. Most stationary targets and drop targets have some kind of decal on them. Clean and replace these if they're worn. For most 80ies games new decals can be bought. It's always possible to make them yourself. Scan the original (or start from a good picture - search on the internet or ask someone who has the same type of pinball machine), Touch it up in a paint program. Print it on self-adhesive paper. It's best to stick a piece of mylar on it, so they won't wear very fast. If the pinball is shot out from somewhere and doesn't take a good path, i.e. it gets shot straight between the flippers, now it's possible to change this. Don't tighten the assembly completely against the playfield but put a washer underneath it on one side so it now has an angle. This will change its behavior. You may have to experiment a bit. Sometimes you must just do a little bit more to adjust how something behaves. On my Theatre of Magic the ball always drained when you shot at the spinner into the short orbit around the trunk. Every time a pinball exited this orbit it drained: with fast balls, slow balls, .. And nothing you could do about it, it went exactly in the middle between the flippers. No nudging or tilting could save you (or by sheer luck). Anyway, it was very frustrating to play this game as there was this center shot which you could not shoot at. The game was not supposed to play this way ! It needs this shot as in one of the modes you need to shoot the spinner, it was difficult to make combos on this game (for which it gives points if you can make them) and shooting the right ramp also became dangerous because when you miss often balls pass through the spinner orbit, so 2 of the main shots were dangerous to do. It didn't play like this before I shopped, then you could just deflect the ball with the tip of the left flipper. But after shopping the metal ball guide probably was assembled slightly different on the playfield than before. Anyway, I had tried everything one would try normally. Changing the leveling of the machine: making it level, making it off center at the front, af the back, .. nothing changed. The hard way then. I tried to hammer the metal ballguide a bit backwards, closer towards the newton ball assembly so it would guide the ball again towards the left flipper. No difference. So in the end I just took my pliers and bent the metal ballguide a bit away from the newton ball. At the very end of the metal plate, and only very little, not even a millimeter. Compare it with another machine and you will barely see any difference. But.. it works like a charm ! Every ball now consistently is aimed towards the right flipper. Slow balls, fast balls, I don't get any drains anymore. The machine instantly transformed and became a totally different game to play, now this dangerous shot is gone. Much more fun to play. And now the balls goes towards the right flipper instead of the left as it's intended to do, doesn't make any difference at all. So you see, sometimes you don't have to be afraid to try or change something if it clearly doesn't work like it should. The game must be fun to play, that's what matters. Replace all rubber on your game with new rubber. Now, what color to use ? The color makes an important difference, if you have time you should just install every color and feel the difference it makes to gameplay. Older games all came installed with white rubber. Flipper rubbers usually were red, but other colors such as yellow or blue also have been used. Starting somewhere around 1995 games came off the factory installed with black rubber. But even then, game designers usually designed the game to have white rubber. Black rubber doesn't bounce as much as white and is used by operators because you don't see dirt on it. But now you cleaned everything the dirt is no excuse anymore. So only on recent games which you want to be very fast you can consider installing black rubber rings. It's a choice you have to make yourself. I prefer to put white rubber on a game, as it'll play much better. Always install white rubber on electro-mechanical games ! They were designed with white bouncy rubber in mind. Black or yellow post sleeves ? Same here, black will not bounce as much as yellow. It just depends on your personal taste, yellow may look better on some games, black may look better on other games. But yellow may be too soft, i.e. if you have strong flipper coils and shoot at a narrow ramp, hit the posts and notice that the ball drains a lot because it bounces off the yellow posts, then you can install black posts and see if it makes a difference. Flipper rubber color. From soft to hard: yellow, red, blue, black. Notice there are 2 kinds of red rubber: European which is soft (and more bright red), and American red rubber rings that are harder (similar to the blue rings). The color of flipper rubbers will make most difference for players. Soft (yellow/red) rubber makes it almost impossible to catch a ball and control it. If a player can't stop a ball before he makes a shot, aiming is very difficult. USA red/blue/black rings are better for this and thus preferred by 'better' players. Even fast pinballs can be stopped and controlled, without unexpected effects. But in the end it just depends on your personal taste. On modern games you probably want red or black rings, while on older games yellow or red. But just know there is an important difference. If you really want to learn every pinball trick and become an excellent player who controls the ball at all times, then you need black flipper rubber on your game. But once you know how to play well, also practice with soft rubber rings as you'll encounter these machines too and have to know how to play on these as well. If you're more a casual player who thinks the most important part in pinball is 'the ball is wild' then do install white rings and red flipper rubbers. If the rubber on a game still looks good (maybe a bit yellow but not broken), replace it. Even if it's only a few years old, it will not be as lively as brand new rubber. It will make a difference to gameplay ! A complete set for a game usually costs somewhere between $15 and $30, so that's a minimal investment to do now you've stripped everything off the playfield. You don't want to be cheap on this. How much time will it cost you if in 2 months a rubber snaps and you have to disassemble half a playfield to replace it ? 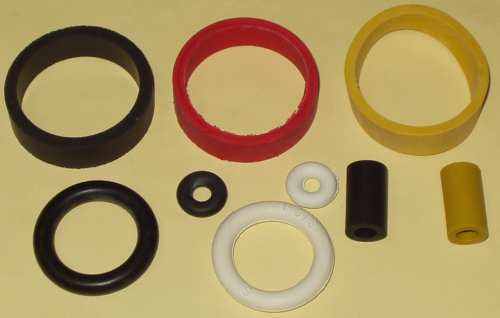 If you don't know what rubber rings you need, you can look it up. Some shops have lists and can sell you a set of rubbers for a specific game. But buying rubber in bulk (if you often shop games) can be a lot cheaper. For some games you can look at the parts list on IPDB.org. 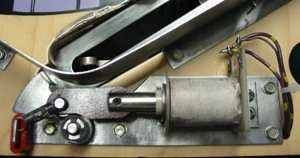 Check the adjustment of drop targets and assemblies. Most of the time these (and other special assemblies which move above the playfield, like Medieval Madness trolls) have a screw which can be used to set the height of the moving part. Check this is set correctly and the target in the down position is level with the playfield. Then it will not influence the path of a pinball, but also not generate any playfield wear at the edges. Because an edge caused by a height difference on the playfield will cause playfield wear where the ball bounces in the air and falls back down onto the playfield. Clean and adjust optos and switches. Clean every opto (transmitter and receiver) with something like Windex. Also clean regular blade switches by pulling a business card through them. Adjust blade switches, make sure they're not set too wide (so they almost never make contact) but also not too close so they generate 'phantom' hits because of vibration. A good test is to set every switch as sensitive possible, go into the switch test of the game, and then slam with your fist on the middle of the playfield. This may not cause any switch to register, if so it is set too sensitive. Keep in mind that if you replace rubber rings, new rubber rings may be a bit thicker then the old ones. So it's possible that blade switches from slingshots are now all the time closed. While you put a new rubber ring on, at the same time check every switch it touches and adjust if necessary. Better do it at once, if you wait until the end and want to adjust every switch at once you'll probably forget some or find some became difficult to reach. 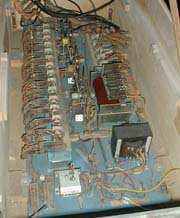 On electro-mechanical games the cabinet is filled with blade switches and relays. So it's a big job to clean them all. You have to decide if you want to do it or not. It will depend if they are dirty, if the game was stored for a long time or often played. You should clean each switch and adjust if necessary. However, sometimes this is dangerous to do, you could misadjust a switch without knowing it. So if you don't know how to fix or troubleshoot these pins, and the machine works fine, it's safest you do not clean anything (until it is obvious the switch is too dirty to make contact). Switches are self-cleaning, if they are set up correctly and get used regular they don't need maintenance. If you bought a game which doesn't work and was stored for a long time, it probably will be necessary to manually clean and adjust every blade switch. Usually these do not require any maintenance. Sometimes the wire needs to be bent up or down. Don't raise it too much or it can cause the ball to hang. Roll a pinball a few times over it. Check the diode is not bent and shorts against the other legs of the switch. Microswitches make a 'clicking' sound when you close them. If they don't, or the wire doesn't jump back, the microswitch needs to be replaced. 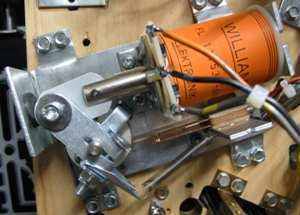 WPC95 Williams/Bally games usually have more bad microswitches than older WPC pinball games. So on a WPC95 game pay extra attention to every microswitch and just replace it if you're in doubt about its condition (certainly if it's in a difficult to reach position). Wire switches which stick through the playfield have to be tested by rolling a pinball over them. When you push them in by hand they'll register fine, but a fast moving ball (especially when it doesn't perfectly run through the middle of the lane but at the side) will not push the wire deep enough to make contact. You'll notice this behavior especially in orbits, when you see that slow balls register but fast ones don't. Then you have to carefully adjust the wire, bend it a bit so it sticks more up, but not too much so slow balls get stuck behind it. Usually you can see on sight if switches are totally misadjusted, i.e. the bottom one in the picture is clearly too low. Put a set of new pinballs in your game. Scratched or rusted balls will work as sandpaper and damage this nicely polished playfield. Check that the bushing sticks high enough above the playfield. If it's too worn your flippers can drag over the playfield and wear the paint very fast ! Check that the plungers and coil stops aren't too worn, or the flippers may not rise evenly. Replace coil sleeve and flipper link, it will make the flippers play better. Check the return spring. Check the end-of-stroke switch, so it doesn't open/close too early and that the 'arm' doesn't stick behind the end, causing the flipper to stay in the up-position. If the flippers are up or down they should be symmetrical. It's even important how sloppy the flippers are adjusted. Adjusting the position of the flippers is something you have to decide for yourself. 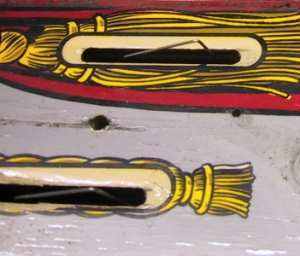 In most games there are little holes in the playfield so you can put a toothpick or pin in it to set the flipper in the correct position (position the flipper bat, without flipper rubber installed). But on some games these holes are not in the correct position. As a general rule of thumb the flippers should be in the same line as the outlane plastic. Any large variation will make the game more difficult to play, certain shots will be harder to make, and gameplay will not feel correct. Make sure you install the correct type of flipper coils. These exist in different types, one is stronger than the other. Stronger is not always better ! When your flipper mechanisms are rebuilt and the playfield is clean and waxed (and you keep it that way), it may even be necessary to install a weaker flipper coil than the manual asks for. So first check the manual and install the correct type of coils. When you notice they're too weak so you can't make ramp shots well (the pinball often rolls back before reaching the top of the ramp) then you can install a stronger type of coil. If coils are too strong then install a weaker type. Too strong flippers are not always fun to play (not enough ball control) and can damage your game as they can cause airballs, break plastics, bend targets, ..
Add new instruction and score cards. The original instruction cards are probably dirty. Or you don't like the plain white ones on your clean and colorful apron. Kens custom instruction cards come to the rescue. For almost every game nice instruction and free play cards are available.